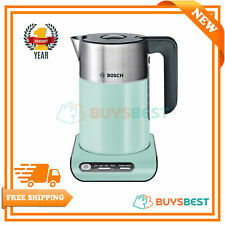 Bosch TWK8632PGB Styline Collection 1.5L Jug Kettle. 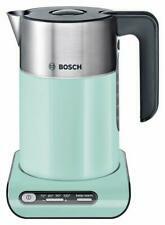 Bosch TWK8632PGB Styline Range Kettle - Turquoise. The keep warm function can re-boil the water to the chosen temperature for up to thirty minutes. 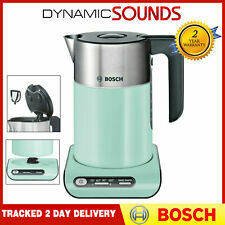 Add a touch of modern design to your kitchen with the Bosch Styline TWK8633GB jug kettle. 2 years Bosch UK manufacturer's warranty. Double wall cool-touch housing: makes it easy to handle, even when hot. Bosch TWK8633GB/02 - Styline Collection 1.5L - 3000w - Jug Kettle - Black/Stainless Steel -. - Black Plastic and Stainless Steel. - UK 3 Pin Plug in superb condition. - Great physical condition - No breakages or cracks. High performance, Eco-friendly and a glossy sleek design makes this kettle stand above the competition. Sound & Vision. Water Jugs & Filters. Microwaves & Parts. Karcher Machines & Parts. Health & Beauty. Bosch TWK8631GB Styline 3kW 1.5L Kettle - White. Stainless steel and cranberry red finish with closed handle making for a stylish modern design. Keep warm function which once pressed can keep water at constant temperature for 30 minutes with minimal energy. The keep warm function can re-boil the water to the chosen temperature for up to thirty minutes. Boil dry protection - automatically switches off when the kettle is empty. 360 degree base. Quiet boil. Benefit from the keep warm function that allows the selected temperature to last for up to 30 minutes. Enjoy the easy operation with one-touch lid opening for easy filling. Still in original box with instructions. Premium stainless steel finish with a stylish design, the Bosch City Kettle is both functional and attractive, and with a 1.7L capacity friends and family can enjoy a generous cuppa. The 0.3L minimum fill will help save energy and the 360 swivel base and 3kW rapid boil give you even more convenience in the kitchen. 1.5 Litre capacity with water level indicator. VERY GOOD CONDITION KETTLE WITH LITTLE USE. Stainless steel and cranberry red finish with closed handle making for a stylish modern design. STILL HAS ORIGINAL BOX AND MANUAL. You are looking at a Black Bosch Styline Digital Kettle which has the ability to boil as little as one cup. It is supplied in a very good, hygienically clean, condition both inside and out, with the minimum of marks. The Bosch Styline TWK8632PGB Kettle features an ingenious temperature control that allows you to choose from four temperature settings for brewing a variety of teas and coffees at the correct temperatures. The keep warm function can re-boil the water to the chosen temperature for up to thirty minutes. ---Keepwarm function: keeps the selected temperature for up to 30 min. ---3 kW ---1.5 litre capacity ---Rapid boil ---Quiet boil ---Boil dry protection - automatically switches off when the kettle is empty ---Removable and washable limescale filter ---Push button operated lid ---Whistles when boiling ---360 degree base ---Manufacturer's 2 year guarantee. High performance, Eco-friendly and a glossy sleek design makes this kettle stand above the competition. Sound & Vision. Water Jugs & Filters. Karcher Machines & Parts. Health & Beauty. Garden & Outdoors. Fast UK Dispatch. With four different settings for different drinks (100 degrees Celsius / 90 degrees Celsius / 80 degrees Celsius / 70 degrees Celsius). Benefit from the keep warm function that allows the selected temperature to last for up to 30 minutes. The TWK86103GB with its black and anthracite finish will suit any kitchen. - Water level indicator. - Boil-dry and overheat protection ensuring safety. 1 x Bosch TWK86103GB Black Styline Kettle. Kettle Base. Water level indicator. Boil-dry and overheat protection ensuring safety. Stainless steel and black finish with closed handle. If there's a problem, just let us know and we will fix it. It has the ability to boil as little as one cup. Key features: - Four temperature settings for brewing a variety of drinks - 70 degrees Celsius, 80 degrees Celsius, 90 degrees Celsius and 100 degrees Celsius. The keep warm function can re-boil the water to the chosen temperature for up to thirty minutes. In the event that your creditor(s) takes possession of your assets. You are subject to an application or order for bankruptcy. The Bosch TWK8631GB will allow you to heat water to the exact temperature you require quickly and easily. 3000W Cordless Styline Kettle. Colour: white. New Kenwood FP120 Compact Food Processor, 1.4 L - WHITE. With the ability to boil as little as one cup, this Which?. best buy kettle also has great energy saving credentials. & The Bosch TWK8633GB Styline Kettle features a keep warm button which maintains The water at The temperature you select for up to 30 minutes. & The eco design saves up to 66 percent energy over a conventional kettle and there & rsquo s even an acoustic signal to let you know when your water is heated. The Bosch TWK8633GB Styline Kettle features a keep warm button which maintains The water at The temperature you select for up to 30 minutes. The eco design saves up to 66 percent energy over a conventional kettle and there & rsquo s even an acoustic signal to let you know when your water is heated. The keep warm function can re-boil the water to the chosen temperature for up to thirty minutes. Tefal TT550015 Toast N Egg Two Slice Toaster and Poached Egg Maker, 1200W- New. Colour: Turquoise. Swan SM22030PN Retro 800W Digital Freestanding Microwave - Pink. The keep warm function can re-boil the water to the chosen temperature for up to thirty minutes. Boil dry protection - automatically switches off when the kettle is empty. We go above and beyond to ensure you receive the best level of service. Er ist mit einem Doppelwandigen Edelstahl-Gehäuse ausgestattet, mit welchem sich die Oberfläche (außen) weniger aufheizt, während das erhitzte Wasser im Gerät länger warm bleibt. Hinzu kommt die TemperatureContor Funktion. Temperaturwahl: 70°C, 80°C, 90°C oder 100°. Warmhaltefunktion bis zu 30 min auf der gewünschten Temperatur. mint/türkis 1,5l. Fassungsvermögen 1,5l. Power Base Only! Used in good working order. Bosch TWK8611P - Plastic Kettle with Stainless Steel Appl. - Styline - Primary color: white, secondary color: anthracite. - International order code: TWK8611P. MPN TWK8611P. Modell TWK8611P. Water level indicator inside read, externally readable, beids. Manufacturer part number: TWK8612P. MPN TWK8612P. Marke Bosch. Comprehensive range. The images can be similar. EAN: 4242002994420. BOSCH TWK8611P Wasserkocher Styline Edelstahlapplikationen 1,5 Liter. Staub- / Waschsauger. Und deshalb lässt sich die Wassertemperatur von 70 °C bis 100 °C in vier Stufen regulieren. Eine LED-Anzeige leuchtet bei der jeweils erreichten Temperatur auf. Power base is in full working conditions. Only power base is for sale. the item may have sign of use. Die Abbildungen können ähnlich sein. Geben Sie Ihren Suchbegriff ein. EAN: 4242002994420. Nur Neuware. Entnehmbarer Kalkfilter aus Edelstahl. Edelstahlboden - Heizung abgedeckt. Deckelöffnung per Knopfdruck. Für 1.5 l Wasser. Wasserstandsanzeige außen ablesbar, beids. f. Links-/Rechtshänder. Und deshalb lässt sich die Wassertemperatur von 70 °C bis 100 °C in vier Stufen regulieren. Eine LED-Anzeige leuchtet bei der jeweils erreichten Temperatur auf. Durch das doppelwandige Edelstahl-Gehäuse heizt sich die Oberfläche außen weniger auf, während das erhitzte Wasser im Gerät länger warm bleibt. Styline - Primärfarbe: schwarz, Sekundärfarbe: schwarz. Entnehmbarer Kalkfilter aus Edelstahl. - KeepWarm Function: Hält bis zu 30 min auf der gewünschten Temperatur. - Produktbezeichnung / -familie: Wasserkocher. Gehäuse Kunststoff. Innerhalb 24 Stunden (excl. Kondition: neu. Farbe schwarz / silber. Wir werden dies ebenfalls tun. Ein- / Aus-Schalter Ja. Label: Bosch. Edelstahlabdeckung der Heizspirale Ja. ). Kunststoff, Edelstahl-Heizschale. Innerhalb 24 Stunden (excl. Kondition: neu. Wir werden dies ebenfalls tun. Label: Bosch. Format: Hardware/Electronic. EAN: 4242002824598. ). Manufacturer-Nr. : TWK8619. -Edelstahl, Kunststoff. Innerhalb 24 Stunden (excl. Kondition: neu. Wir werden dies ebenfalls tun. Label: Bosch. Format: Hardware/Electronic. EAN: 4242002994451. ).